Following a brief break for the holidays, March Menard JV is now back at work on the stone column installation with around 1400 of the approximately 7200 columns required now in the ground. A fourth 80-tonne crane has been working on the site since December and the stone column work remains on track to be completed in May (see the cranes in action here). As the cranes get closer to the fence on Antigua Street it may be necessary to temporarily restrict access to short sections of the footpath and adjoining car parks to protect pedestrians from any slip hazards and prevent any potential vehicle damage from a wayward stone. The car parks and footpath would open again as the cranes move further west. Prior to Christmas some sheet pile testing was also carried out on the site in the newly solidified ground. Sheet piles are interlocking sheets of steel that will allow dewatering to be carried out, so the pool tank and other underground services can be safely excavated and installed. Also before the holidays we received the tenders from the potential Main Works contractors. Thousands of pages of documentation are now being evaluated by the team before negotiations begin with a preferred contractor in the coming weeks. 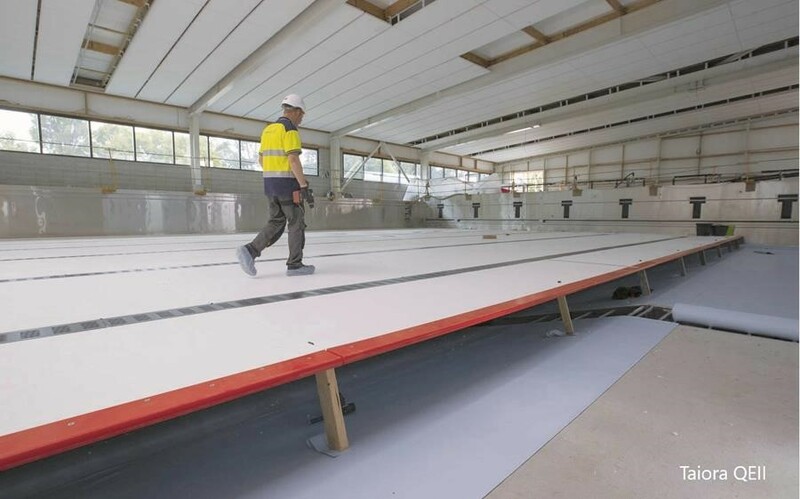 The 50m competition pool in the Metro Sports Facility will have a moveable floor at the end closest to the leisure water area. The depth of this 15m section of the floor will be able to be set anywhere between 0 - 2.2m (the depth of the competition pool). As we are seeing at the new Taiora QEII facility, this feature ensures pools can offer something for everyone. Christchurch City Council will be able to set the depth to suit the likes of Swimsmart classes, aqua jogging and lane swimming at various times throughout the day with the push of a button. Add into the mix the moveable bulkhead in the competition pool at Metro Sports and the separate diving pool and the facility can cater for swimming lessons over the moveable floor, while having lane swimming across the remainder of the pool, at the same time as a water polo match is being played in the diving pool. The ramp into the competition pool is also adjustable to align with the moveable floor to give as many people as possible access to all areas. The ramp can also be elevated to a level flush with the concourse during events.